This year’s retrospective at Tate Britain coincides with the artist’s eightieth birthday and is the largest yet. Presumably, it will be the last. With over 250 works, stretching over a sixty year career that has been both varied and prolific, we glimpse a bygone era in British art, remote from the interests of say Peter Doig, Glenn Brown, Cecily Brown or Jenny Saville. The Tate last mounted a survey of the artist’s work in 1988. Twenty-nine years is ample interval but there are few surprises in the current selection since exposure for subsequent work has been pretty much continuous. Another survey is really the opportunity to assess the body of work in a longer perspective. Hockney’s popularity with the general public, if anything, has only grown (advance ticket sales set a new record for the gallery) while critical opinion increasingly finds his work since the sixties disappointing. This familiar split in evaluation arises over the steady drift to more traditional and conservative modes, made all the more so by competing developments in painting. The problem is Hockney achieves recognition very quickly, while still a student at the Royal College of Art, so that expectations and his own ambition generate a momentum that proves impossible to sustain. His work at that stage declares a faux-naïve frivolity and detachment, a knowing nod to art world fashions and a diary-like self-regard and promotion. It is a heady brew. The work overlaps with Pop Art where the artist gives prominence to packaging designs for Typhoo Tea or Alka-Seltzer and text variously recalls comic strips and illustration, particularly in the use of Letraset, the adhesive lettering used in advertising layouts in pre-digital times. At other times the work flaunts a layout-like arrangement of disparate objects or insets upon a bare ground, elsewhere geological cross-sections stand for an actual mountain range and similarly allude to commercial graphics, composition at its most prosaic. 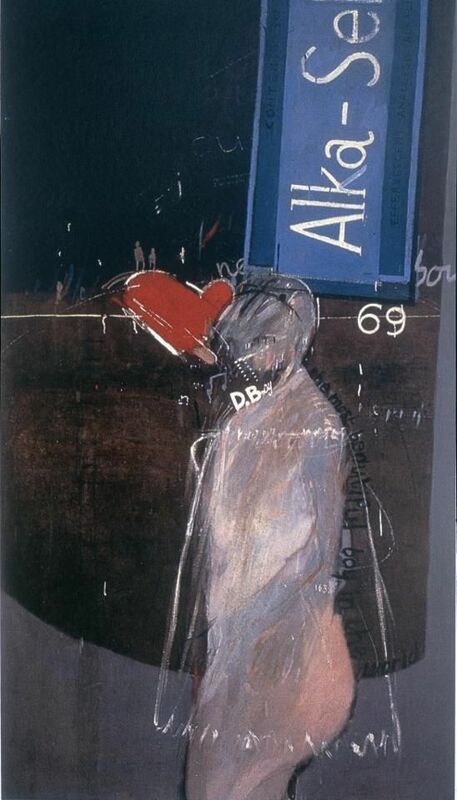 In 1962 fellow artist Richard Smith astutely summarised his work as “an ad-man’s Sunday paintings” . But the Pop elements are really only style options among others, to be toyed with in a calculated levelling, all in the service of an amusing insouciance, a blanket rejection of orthodoxy in art and life. 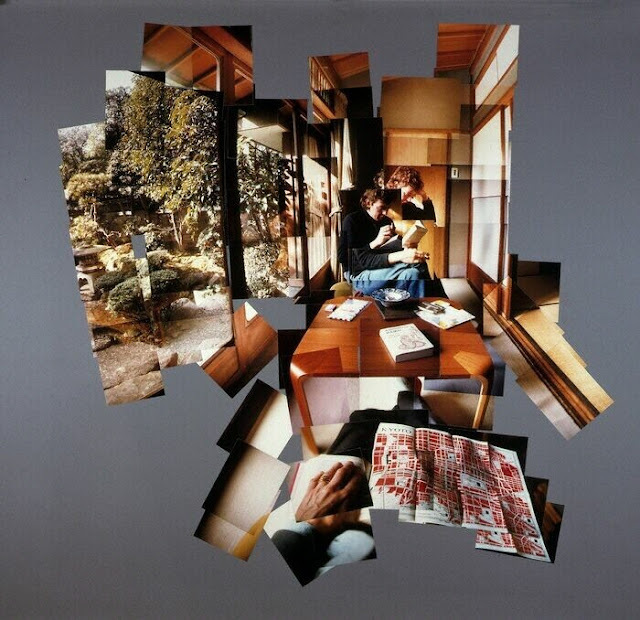 This is the initial Hockney style or brand and it finds subjects in tourism, glamour, bathing, camp formality, homo-erotica, literature and other fiction. It trades in a deliberately sketchy, desultory touch. It plays fast and loose but it cannot last. 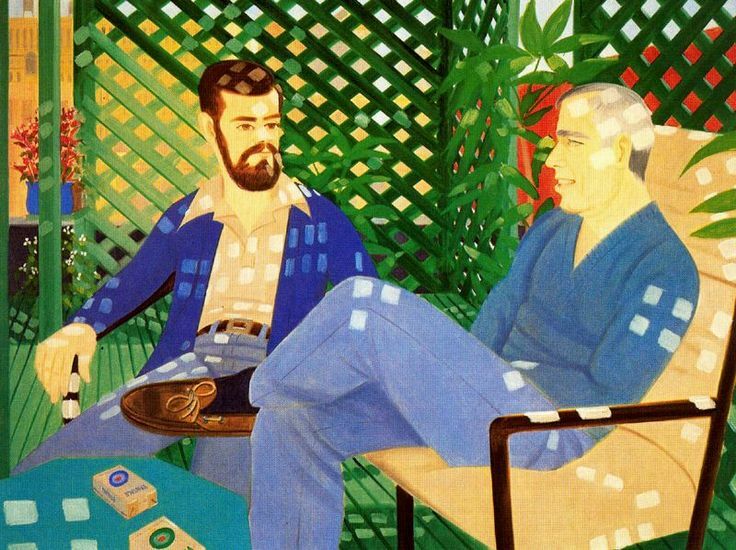 For while Hockney embraces a compelling eclecticism, a kind of Post-Modernism before its time, his grasp of style soon leads him into greater degrees of realism and complexities he is ill-equipped to deal with, temperamentally or intellectually. 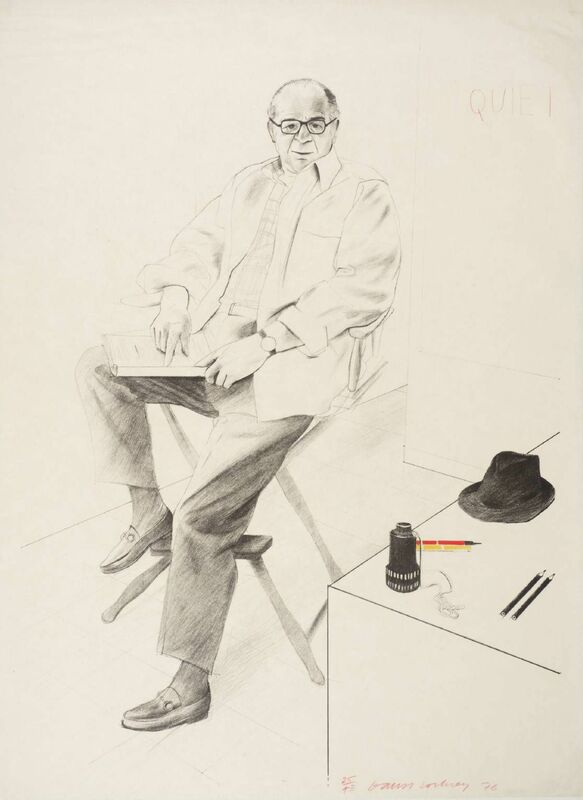 In theory, Hockney could remain blasé about any number of subjects, happily shuffle them for novelty and sketch endless droll arrangements, but in practice the artist becomes all too aware of his reputation and wants something more from it. This is where youthful élan surrenders to something more solid, crafted and frankly dull. By the early seventies the homo-erotica has gone, the text and graphics have gone; the whimsical fiction and fey drawing have gone, the garish new acrylics have gone, the flat, set-like architecture has gone, replaced by actual theatre design. What that leaves is bland. His painting lapses into stilted portraits of couples, notably giving each other plenty of room while looking elsewhere. Quite apart from glaring deficiencies in technique for modelling faces, the pictures simply lack energy or life, as style or substance. The underlying rationale is now not so much frivolous as trivial. We have realism at its most picturesque, stylisation at its most discreet and none of it is much fun. Hockney’s slide down the stylisation scale coincides with the trend to Photo-realism and a searching examination of print properties for photography, revealed through painting. 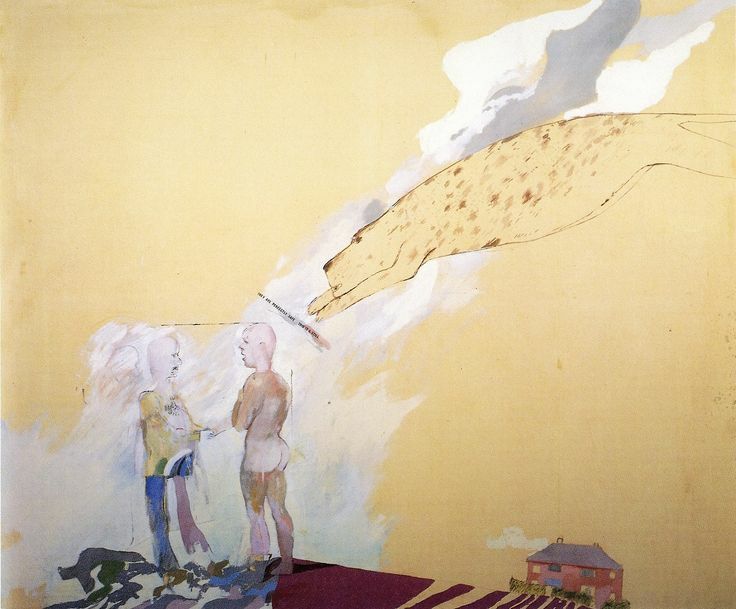 Realism certainly has currency by the seventies, but it is really as a development of Pop Art and the sampling of common print imagery through painting (by which painting archly declares its own properties). 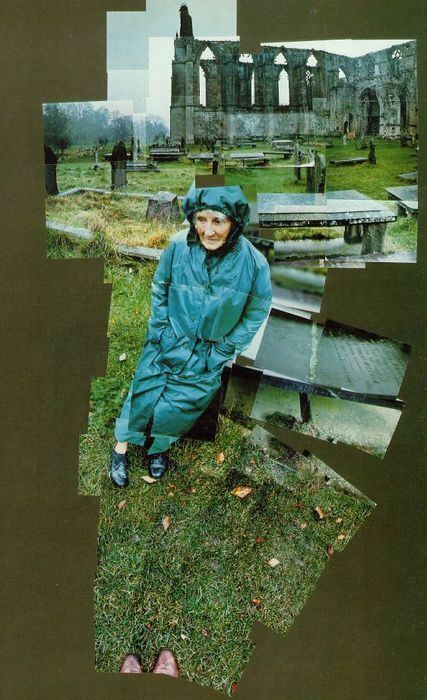 But this deadpan, seemingly impassive exploitation of photographic qualities runs counter to Hockney’s tastes. It does so for the same reason he could never entirely be a Pop Artist – the requisite cool and detachment never offered enough scope for his non-conformism. But it is this more rigorous analysis of realism as photographic practice or convention that ultimately undercuts Hockney’s efforts to recover painterly realism. While he is intent on some level of detail, he is plainly neither capable of nor inclined toward, it is unclear what this is to be, if it is not photographic, or how much detail will be sufficient. For the Photo-realist the issue simply becomes one of accepted practice, now artfully reframed. 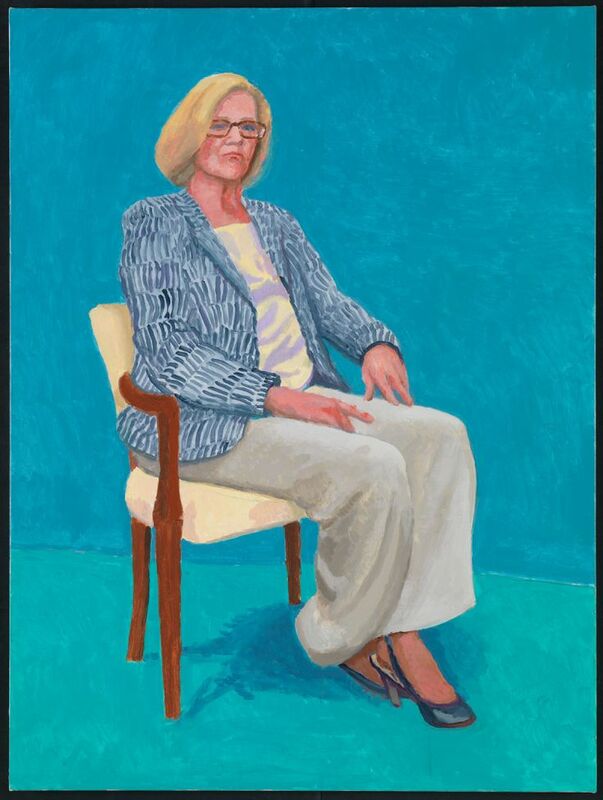 Hockney tacitly recognises the problem eventually and the series of double portraits grinds to a halt. Incidentally, the Photo-realist’s weapon of choice, the new, extremely delicate air-brush, remains one novelty Hockney can resist, remarkable in itself. There are works from later in the seventies where he attempts to recover his more freewheeling, scattered approach but these are now heavy-handed in allusion, flat-footed in drawing or touch. There was no going back, unfortunately. 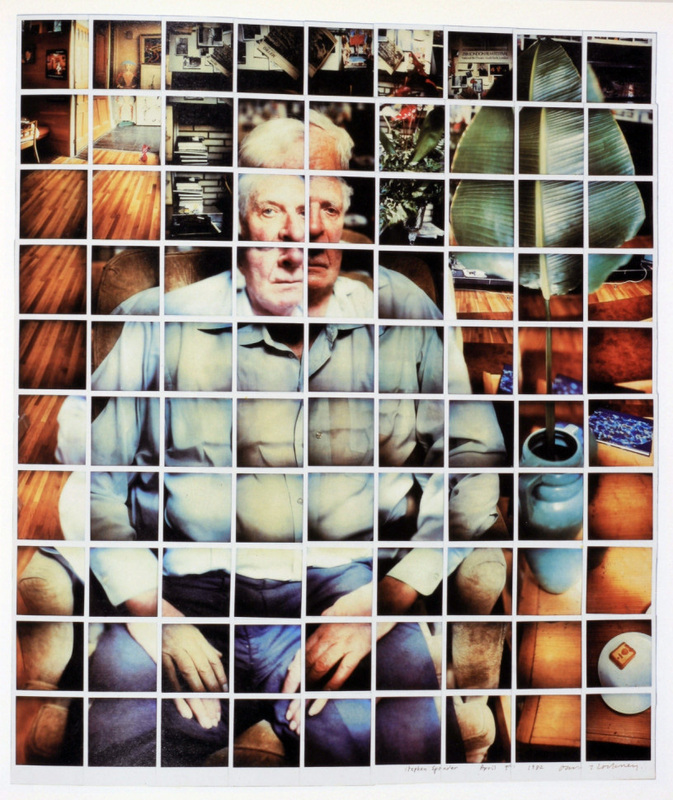 The irony is that Hockney has always been an avid, if somewhat indifferent photographer. His photographs often supplied details for paintings. But the mechanics of film stock, lens length, light levels, focus, shutter speed, processing and printing options go unexamined, even as these decisively influence styles or categories of picture. For one devoted to pictorial style, it is a regrettable omission, for one devoted to painting’s pictures, it is a decided handicap. 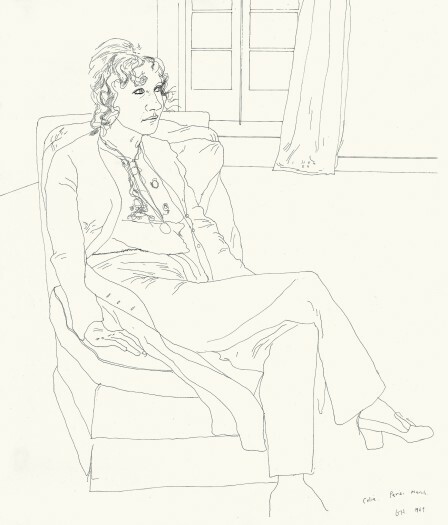 Where Hockney finds more leeway is in drawing over the period. His talent has always been firstly with drawing and it is his early prints made at college that first bring him recognition. Line obviously provides scope to depict without colour or modelling so that it offers vivid stylisation by default. Line is notably quick or brief into the bargain. 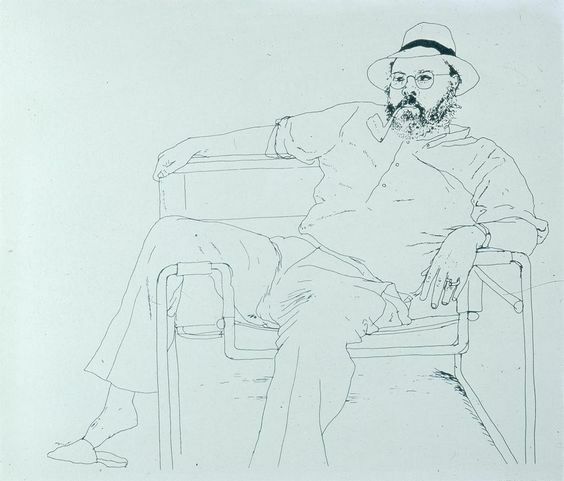 His drawings can be divided into two strands, one as crayon or coloured pencil studies, where colour attains a surprising vigour through broad, heavy strokes and a convincing signature touch, the other, as extremely fine ink drawings, without modelling or tone, these often transferred to etchings. Both are often done before the motif, or from ‘life’. 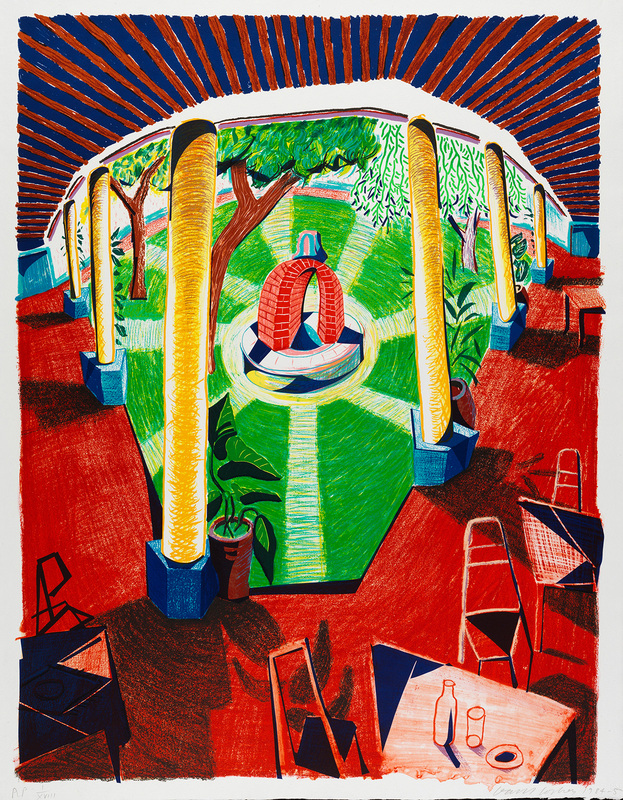 One of Hockney’s undeniable achievements is to bring new respectability to coloured pencils as a medium (although Late Picasso offers some impressive examples) and while it allows rich colour options even in sketching, initially it also prompts greater simplification or stylisation and speeds Hockney’s powers of composition. The line drawings take advantage of the latest in draughting pens at the time called Rapidographs, with a continuous supply of ink, somewhat like a ballpoint, in a range of round nibs or even lines. 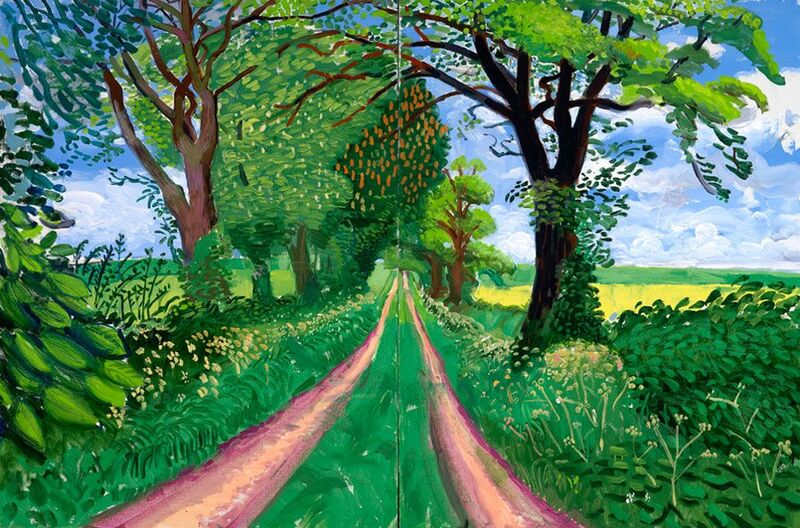 Hockney selects an extremely thin line; as if to emphasise it’s tentative, teasing nature and at first it is the exquisitely uniform, spidery line that instantly transforms subject matter, gives it a brittle, obtuse quality. With practice however, the line gains in fluency and an academic accuracy so that by the seventies he can more comfortably accommodate a degree of realism. But this too weakens where ink lines are replaced with pencil or crayon and supplemented with tone. The stream of formal portraits from the period soon look little more than anonymous illustration or hackneyed. Again, these prove extremely popular with the non-specialist because they are so undemanding, reassuring and traditional. But ultimately they announce artistic decline, steadily defer to an earlier period. By the end of the seventies, his forays into set design and theatre lighting bring a new appreciation of colour and scale; together with Expressionist drawing that owes much to Matisse and Van Gogh – too much really – little or nothing to the sweeping Neo-Expressionist movement of the time. Where Neo-Expressionism (hardly a revival incidentally) offers bold allegory and metaphor in blunt enactments of painting, Hockney clings to literal views such as the sprawling Mulholland Drive (1980). 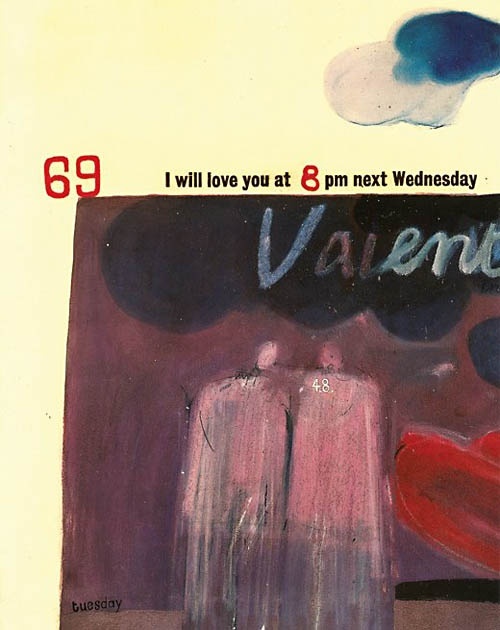 The work seems not so much shallow or whimsical in contrast with an Anselm Kiefer or Francesco Clemente as pointlessly shrill in palette, cluttered and chaotic. The aim would seem to have been a more orthogonal or map-like picture, but in his haste to escape standard perspectives, pesky detail and local colour, the artist simply overloads in a bid for a grand statement. The Minimalist slogan ‘less is more’ was never more applicable. A feature of such work is the vigorous and varied patterning to shapes, by broken brushstrokes, incised linear motifs, stripes and curves. Part of the problem with Mulholland Drive is the scale of patterning to depicted objects; partly it is in the matching of pattern to colour. There has always been a strong decorative element to his stylisations so it is not surprising that this should resurface now in more relaxed, if sadly, indiscriminate manner. But the decorative remains a core component of his version of painting, an ordering against which to measure realism. 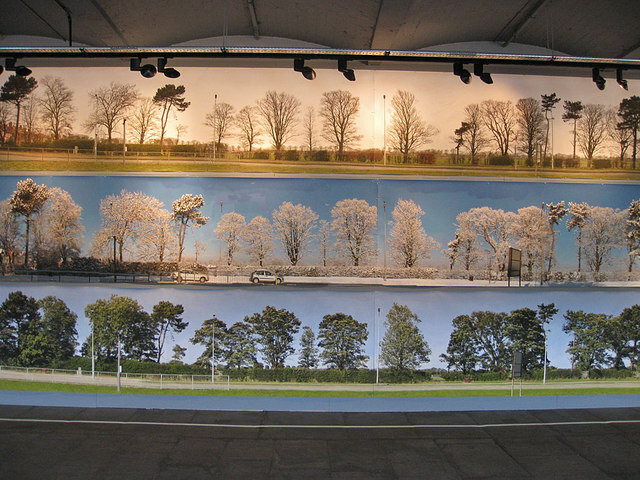 This new attention to panoramas is accompanied by collages of photographs (initially Polaroids) taken from the same position but in slightly different directions with the same, mid-length lens, so that each photograph overlaps in content with its neighbour while retaining slightly different perspectives, and because of the camera’s inbuilt light-meter adjusting shutter speed according to reflected light along each direction, differences in exposure often result in surprising fluctuations of tone. 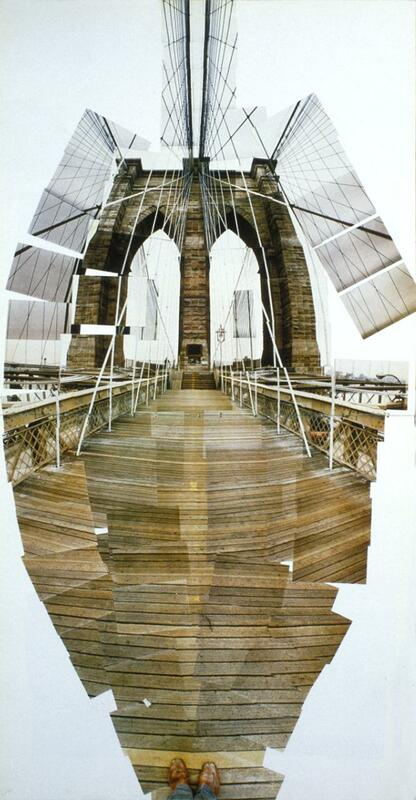 The artist terms such collages 'Joiners'. As a whole, when consistent in position, the works more or less resolve into an extremely wide angle lens or fish-eye, with each photograph taking on a scale-like modularity. There are variants whereby position is changed for certain objects, creating more of a Cubist effect, at other times a kind of geometric pointillism, particularly for skies. 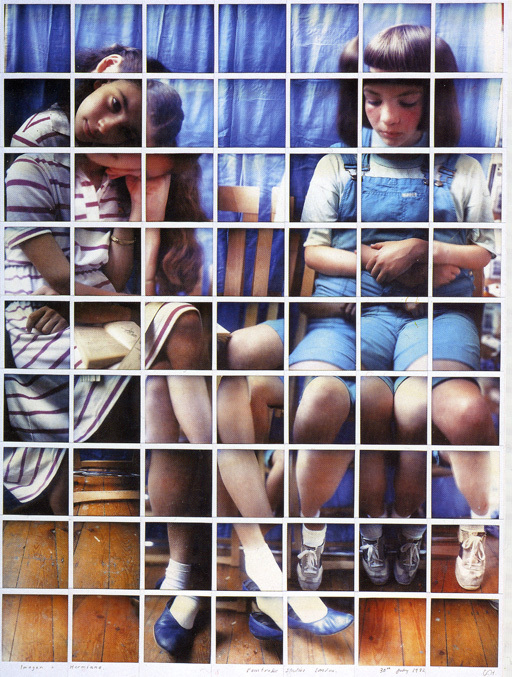 The Polaroids retain a grid-like arrangement using their white borders while prints from 35mm film without white frames allow for a closer, more varied assembly. For the most part such work necessarily results in panoramas, laterally or vertically, in some cases pursued on multiple axes for an irregular picture shape. Works typically evince an impressive depth or distance and amass daunting detail. Clearly this is not to be the work of painting for the artist, although this does not seem to have deterred a contemporary such as Rackstraw Downes. 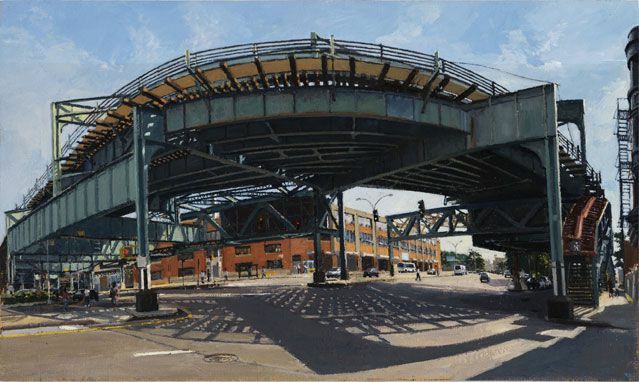 The spatial dispersal is explored in paintings that radically simplify objects, while maintaining something like a fisheye lens or involving a great number of vanishing points. The works recover a little of the playful, toy-like character of his sixties work but are curiously confined by the rigours of perspectives. So much of Hockney’s later career is spent trying to reconcile a playful pictorial sense with an underlying formal significance. Most of the time, the opposing impulses negate one another. The Joiners become the focus of a vigorous polemic by the artist on the nature of visual perception and the conventions of realistic depiction. In the media he rails against the fixity of perspective, its inculcation through photography and the value of painting’s more considered distillations. Not only does this seriously underestimate the photographer’s art but it broaches a theoretical minefield concerning the nature of visual perception. Briefly, there simply is no one automatic or natural way of looking at something. The artist quotes Leo Steinberg’s famous phrase ‘The eye is part of the mind’,  but seems unaware of the implications. All depends on anticipation and co-ordination with other senses. More pragmatically, Hockney is simply looking for some deeper rationale for painting, set against the popularity of photography. As noted, Photo-realism has already advanced this difference in subtle and modest ways but these are never conspicuous or dramatic enough for him. Instead he must rake over the coals of Modernism, glean what he can from Matisse or Van Gogh and insist upon its authenticity as seeing, for painting. Not surprisingly, his claims are ridiculed by critics, even if they make for entertaining television or interviews. 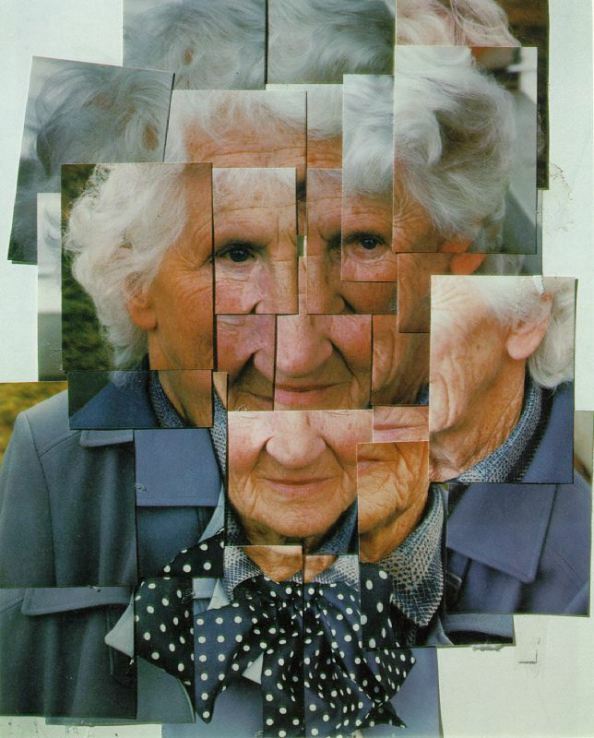 Later, such collages become the staple of school projects, endless pastiche, a routine software solution and even an online ‘Hockneyizer’. 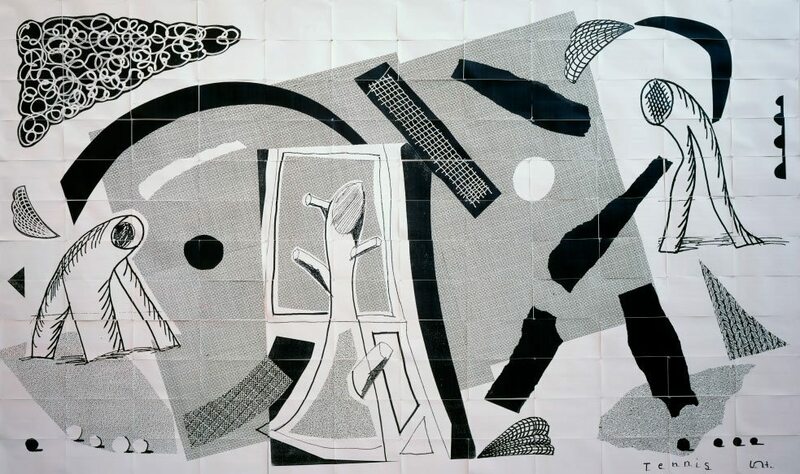 The convergence upon Synthetic Cubism in the collages inevitably suggests a Picasso-like turn for his painting by the mid-eighties. 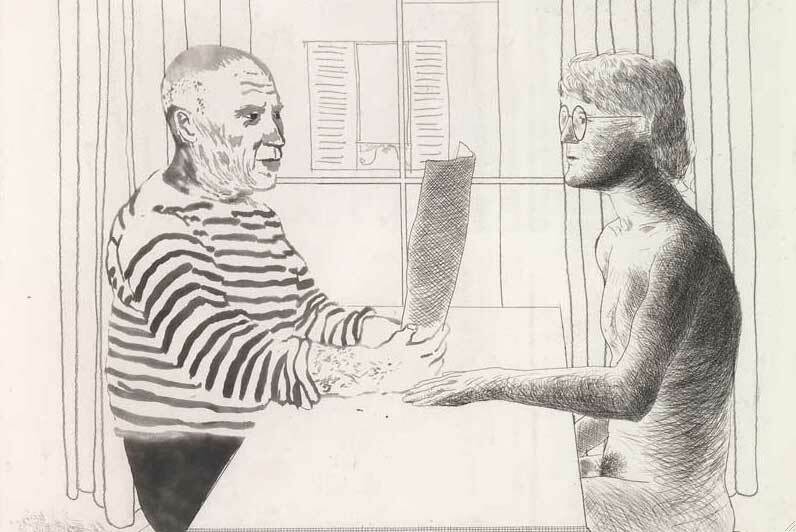 Indeed, Picasso has been an abiding influence for Hockney since his student days. The surprise is that he is now prepared to be so forthright. By the mid-nineties this leads to greater abstraction in his modest Snail Space paintings, where curved planes are still crudely patterned, colour remains rich and raw, depth is rehearsed as a fun-house. These are actually as close as Hockney’s work has come to abstraction since his first days at the Royal College of Art. Where abstraction arises in his sixties work, implicitly (in architecture) and explicitly (in his Hollywood Collection, for example) it is the object of derision. But we all move on. The abiding impression of the Snail Space series is actually of a pastiche of mid-twentieth century School of Paris, perhaps a Maurice Estève or Fritz Glarner and unintentionally amusing given the inspiration. 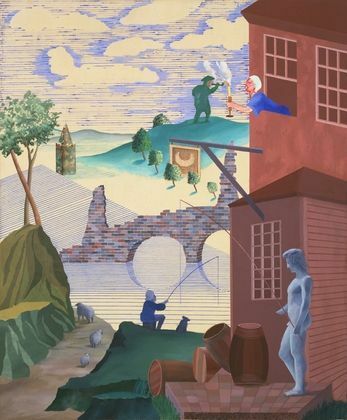 But the series appears at a time when Post Modernism urges greater eclecticism, particularly from Pre-Modern sources, so that Hockney’s work is again rendered passé and conservative as homage. 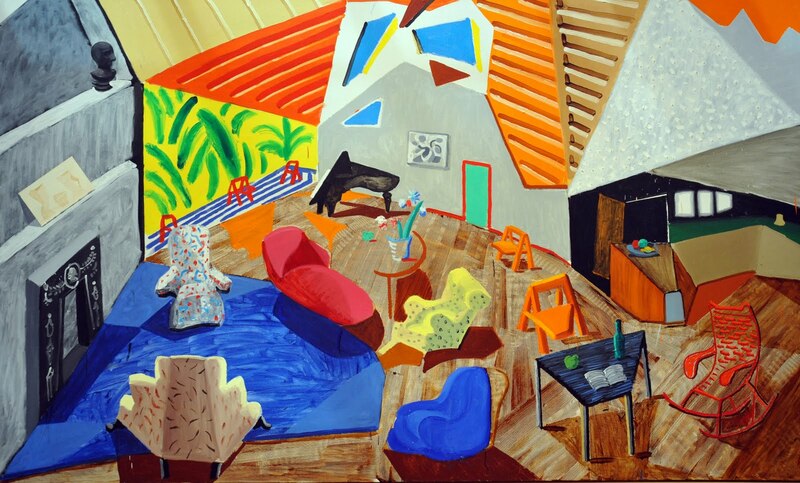 There is no way back to the kind of Modernist fundamentals Hockney now steeps himself in. Painting has other issues. Not that Hockney need attend to art world fashions by this time. Like many artists in middle age, he is happy to see himself as heir to Modernism rather than refugee from it. And for the same reasons, his career only gains in momentum amongst the general public and public institutions, eager to maintain an established history, to frame tradition with footnotes. This entrenchment in the establishment takes on its own momentum eventually. It is then in institutional interests to maintain a favoured artist’s reputation just as much as it is prudent for the favoured artist to defer to tradition. There is a certain amount of insider trading, in other words. And where a market has grown vast and volatile, it may prove a useful check and balance on evaluations. An artist thus becomes slave to their own success and is steadily drawn into a retrograde but rewarding mediocrity. This institutional heft can also encourage hubris and self-indulgence on the part of the artist and Hockney succumbs spectacularly at the turn of the century. He pursues an intuition on optical aids available to artists since the Renaissance, purely on the strength of his experience drawing portraits. He began from studying the drawings of J.A.D. Ingres in 1999, where he quickly suspected that the artist had traced a projection, because the scale was so small by current standards, the outline conspicuously crisp - and because he would have difficulty working in this way! Quite apart from the argument and evidence he assembles, it is the disturbing presumption of his lofty abilities as reasonable measure of expertise that gives pause. While camera obscuras and camera lucidas are generally acknowledged to have been used by some artists at different points in art history, Hockney learns from Charles Falco, an expert in optics, that concave and convex mirrors can also project a reflected image, in a suitably darkened surrounding. Such mirrors were available much earlier than the lenses needed for camera obscuras or lucidas. They thus might explain realistic features of earlier painting, such as in the work of Jan Van Eyck and Robert Campin. But since there is no documentation mentioning such a practice, Hockney supposes the use of mirrors remained a trade secret, in the highly competitive centres for painting. He and Falco published a paper, ‘Optical Insights into Renaissance Art’ in the specialist journal Optics & Photonics News, (vol. 11. 2000) where it met with polite interest. However, Hockney was intent upon a much more elaborate presentation, an altogether bigger splash, and in 2001 published the lavish ‘Secret Knowledge’ a large format book (328 pages, 510 illustrations, Thames & Hudson). The book scarcely credits Falco, surprisingly. It received extensive promotion, was widely reviewed and even prompted a conference on the theme of Art and Optics at New York University, attended by many distinguished art historians and theorists. In 2003 BBC television made a lengthy documentary (75.5 min) in which the artist guides us through many of his insights. He gained an enormous audience and the desired notoriety, but the thesis was far from convincing on any number of counts. Why mirrors alone should remain a trade secret, even after they have been notionally superceded by publicised lens devices in the 18th century is the first sticking point. The more artists Hockney detects possibly using such mirrors, across the centuries and straddling the whole of Western Europe, only stretches the plausibility of some carefully guarded trade secret that eludes any written reference from interested parties, any supporting artefact. 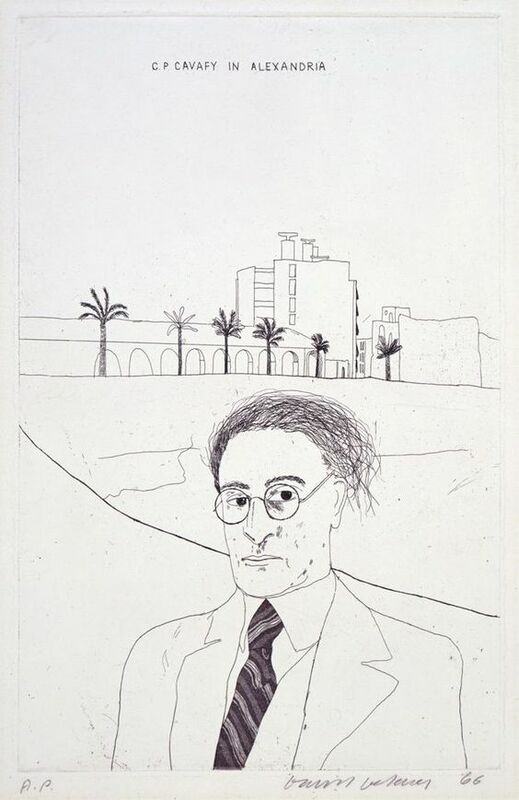 The next is Hockney’s scepticism of the artist’s abilities to measure proportion, tone and perspective freehand, to draw accurately by unassisted observation, or what he calls ‘eyeballing’. Yet artists traditionally spent many years practising just this, progressing from copies of approved drawings and descriptive geometry, to drawings of still lives and plaster castes, to studies from the model. Such accuracy is no more exceptional than the ability to judge distance in parking a car precisely, in any number of sports that require moving a ball with enormous accuracy, in the use of any number of delicate medical and scientific instruments, amongst other activities. Hand/eye co-ordination may be marshalled to formidable tolerances. Indeed, mistakes in expert freehand drawings are unlikely to be more frequent than in tracing, so that lens aids even if available, provide no shortcut or guarantee of more accuracy. On the contrary, they may well prove much slower, error laden with problems of depth of focus and illumination constancy, as well as more expensive or fragile than freehand methods. At best the book demonstrates that the use of mirrors is consistent to some degree with certain features of the works in question. 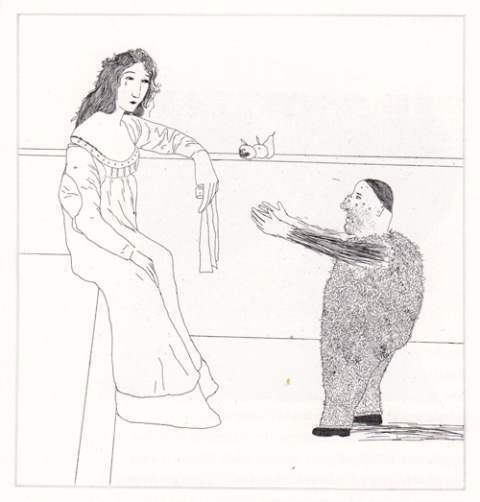 But it does not provide a complete recreation using a mirror and it cannot exclude the possibility that such features could as easily have arisen through freehand error, careless or ignorant application of perspective, inattention to proportion, detail or overall coherence, not to mention eccentricities to the object depicted or artist’s sight or intentions. In any case, accuracy is not enough. Passive recording or tracing in themselves do not make for a vivid or interesting painting. The artist must confine accuracy to more unexpected and germane corners, must forgo some aspects in order to highlight others. The author acknowledges that artists, if they did use mirrors or lenses, did not do so exclusively or entirely, that once provided with accurate underlying measurements in some cases felt free to demonstrate a far more casual approach to detail, as in the work of Frans Hals. But he can offer no explanation for this. Similarly, he allows that artists such as Peter Paul Rubens do not seem to have used optical aids, but nevertheless were somehow influenced by them, but cannot say in what ways. Secret Knowledge offers a very murky and muddled art history. It declares there is an abrupt break around 1420 and that the only explanation art historians can offer is that “drawing improved” (stated in the 2003 documentary with some amusement). Yet a standard treatment, such as E. H. Gombrich’s The Story of Art and its ancillary volumes Art and Illusion and The Image and the Eye go to great lengths to explain precisely how such changes occur through a gradual process of schema and correction under novel and local circumstances. These offer not only a more comprehensive and sophisticated account but eliminate naïve conceptions of realism, of natural vision or innocent eyeballs. That, however, is the real world of scholarship rather than shallow world of celebrity pretension. 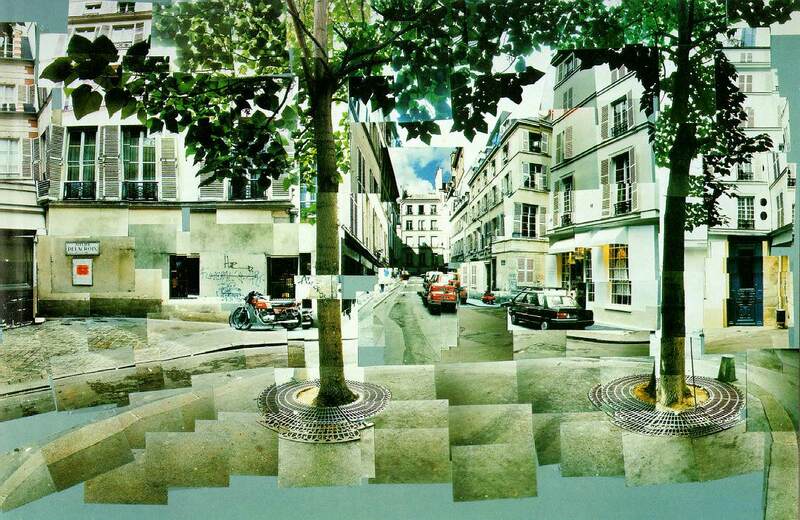 In the latter, Hockney must have his gimmick, his secret little gadget that delivers the shortcut, even in art history. He is however, simply wading in way over his head . Even at the level of description, much of Secret Knowledge is flawed. The American artist and academic, Ann Massey swiftly corrected some of the most glaring errors. Here, just one will suffice. The claim that a proliferation of left-handed subjects occurs in late 16th century painting, because of the use of projections that reverse the image, is illustrated with, among other works, The Carracci's Boys Drinking (1582-3) where the subject holds a glass in his left hand. But the painting actually shows the subject pouring wine from a carafe to a glass. He holds the carafe in his right hand, since that requires greater control, the glass in his left. Other paintings by the artist from the period show subjects holding all manner of items in their right hands while their left hand is unoccupied. Moreover, works by other artists from the period picture predominantly right-handed people. Time and again Hockney fudges the facts to support his theory . Elsewhere the theory stretches to extraordinary lengths, so that the mere presence of strong light and shadow in a picture is taken as an intrinsic feature of lens or mirror projection. Since strong light and shadow are found in classical murals and mosaics, he later suspects (in the 2007 edition) these too are the result of a culture well acquainted with mirrors, albeit only of polished metal, but with a burning ambition. He appeals to the theories of optics that originate in Classical Greece, although theories such as those of Euclid and Aristotle are firstly theories of light and vision. While Aristotle anticipates the camera obscura and Euclid devises geometric rules for perspective, as a property of sight, at no time are these applied to pictures . Moreover, classical painting never quite acquires perspective, juggling various oblique projections instead. But it does master light and shade. If both derive from projected images as claimed, why are not both present in Greek painting? This too goes unaddressed. Not to mention that all this is now at odds with his pivotal year of 1420. The 2007 edition considers a Fayum funerary portrait – a late heir to the classical tradition – and cannot accept its volumetric modelling as more than a convention since it was not shared by Chinese, Persian and Indian traditions, as a sort of consensus on nature [p.228]. But while none have use for the kind of deep shadow indicated along one side and below the nose, all allow a minimum of shading or modelling to volumes at times, all had mirrors. And just because these traditions have no use for deeper shadows, hardly makes such shadows useless. Shadows probably arise for the Greek painter firstly as a way to grant volume to a figure, to indicate further properties or particularity, much as occurs in Greek sculpture, as it refines proportion and anatomy. (In painting this development is usually attributed to Apollodoros sometime in the 5th century B.C.) Whether directly observed or assisted by projection, the artist can stretch the function of line and colour to new modalities and integration, make more from materials and nature. Darker and more extensive shadow may add to properties such as time of day or year for a place or person in it. These aims need not be shared by other traditions, obviously, but unquestionably prove useful to later cultures. The book has been worth dwelling upon not just because it indicates an alarming laziness to observation and naivety to argument but because it discloses two principles throughout that steer much of Hockney’s later work. The first is the value the artist places on inclusion and proximity, with being ‘in’ the world rather than outside looking in through a window (one might stretch a point and suppose acceptance). The second is the value accorded accurate recording and impersonal or mechanical realism. The first inclines the artist toward the multiple or fragmented construction introduced by his Joiners and furthered in painting, digital prints and videos that increasingly focus on landscape. We return to these presently. The other is the formal portrait, usually seated, sometimes as merely head or bust, but in which individuality all but dissolves in the formulaic. Significantly, he includes his own drawings using a camera lucida in Secret Knowledge, to purportedly approximate the drawings of Ingres, after a year’s practice with the tricky device. But when placed side by side [p.30-31, 2007 edition], the impression is not just of a coarser or inferior pencil technique on the part of Hockney, but how much more incisive the Ingres examples are, in terms of character or expression. Hockney selects his subjects from guards at the National Gallery in London, ostensibly to have strangers as subjects just as Ingres did, but his careful attention to accuracy somehow mutes personality. In truth, it is unlikely that the Ingres examples were the artist’s first or only drawings of his subjects and that what tracing seems evident is part of a subsequent version where the artist sharpens tone and omits provisional lines . Nothing of this is undertaken by Hockney and in all respects it is a telling comparison. It is not that Hockney cannot see as much as Ingres but that he cannot or will not make as much of it. He is just not that interested or comfortable sizing up a stranger, polishing the effort. He is not doing it as a necessity or livelihood as Ingres did, but merely as a test. 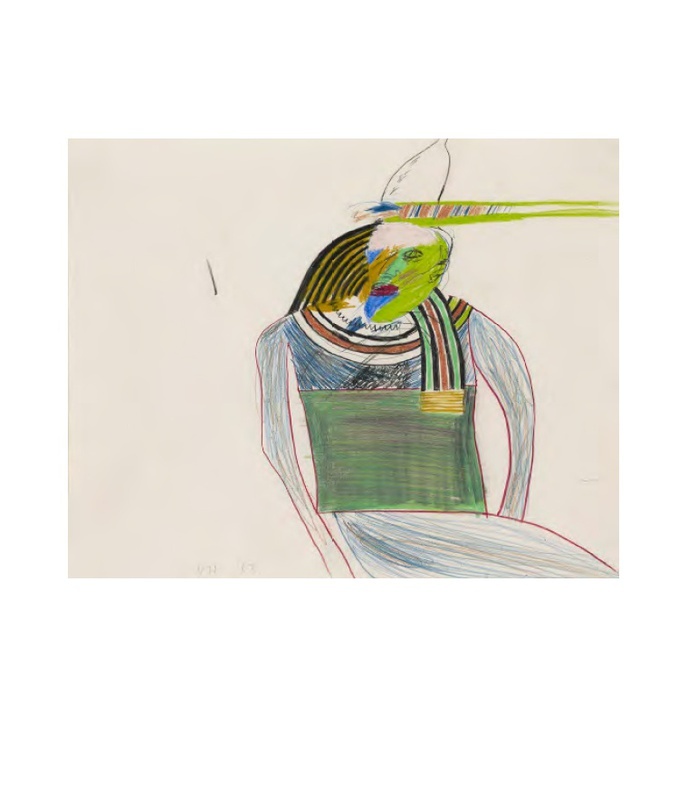 So his drawings remain achingly cautious, softened and inconsequential. And it is this passive disposition that actually drives the search for more efficient and accurate means, while at the same time misguidedly scorning the options of photography. But neither can compensate for personality. The problem is not so different from the double portraits of the late sixties and early seventies, only the technique has changed. 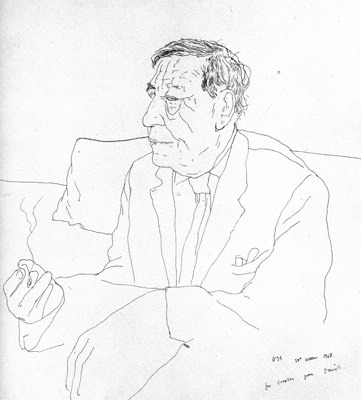 This remains true of the series of eighty-two portraits completed in 2016 and donated to Tate Britain, where he returns to direct observation of a wide array of friends, colleagues and acquaintances but deals in only the vaguest of resemblances, all sharing the same colours to bare backgrounds, the same chair. Viewed as a suite, the impression is of stunning banality and excess, but by this stage that should come as no surprise. The landscapes by contrast, exclude the figure and in recent years dwell upon picturesque views of rural East Yorkshire. These too are painted from direct observation or ‘on the spot’ but interestingly, abandon the fragmented or multiple perspectives of the nineties and return to a more unified point of view, although now distributed over a matrix of panels or canvases and on an epic scale. 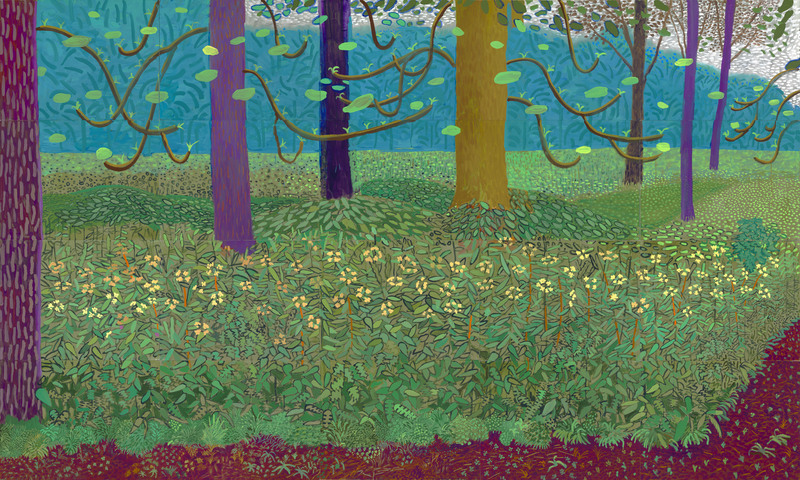 If the portraits find Hockney at his least interested, the landscapes show him at his most confident and playful. In place of the supposedly more inclusive shifts in perspective, the artist now relies on imposing scale to engulf the viewer. The change occurs around the time of Secret Knowledge and it is tempting to see it as implicit response to trenchant criticism of the book, but then again it may just be an older man seeking simpler solutions. The inclusiveness sought would also seem to prompt a greater attention to foreground, a greater obstruction or narrowing to horizon. 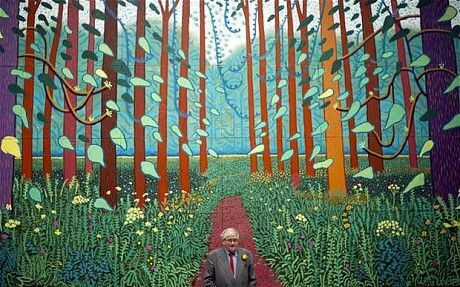 This certainly suggests more proximity for the viewer but the restricted depth then invites a more overall or pattern-like treatment and here Hockney can give free rein to his decorative impulse but the effect is anything but involving. On a grand scale such works instantly recall theatre backdrops, appropriately. But this lack of depth begins to look shallow in other ways. Other pictures take a more playful approach to simplification or stylisation and these recover something of the momentum of his youth but as often recall children’s book illustration. Again the whimsical, teasing quality is not without its connotations, but this too falters with the artist’s lumbering line or touch. 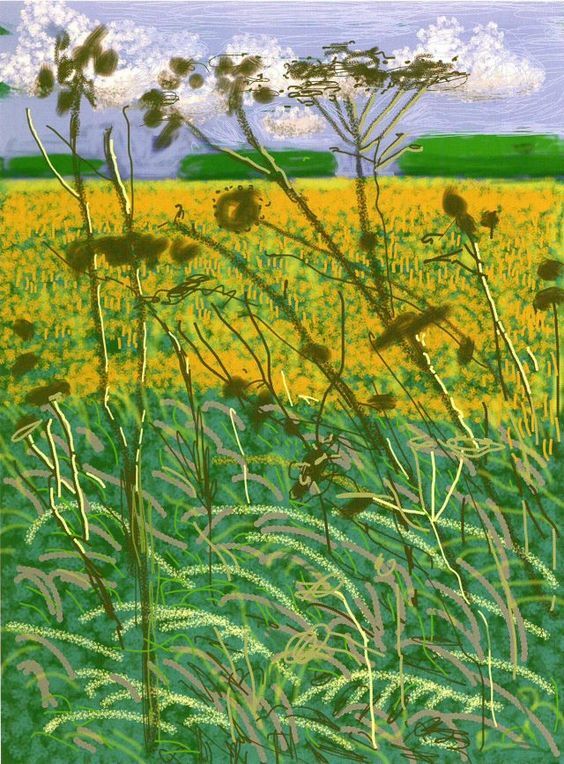 Hockney never quite achieves the economy or touch of something like an Alex Katz landscape because he has none of the dedication. He can diversify impressively and use basic graphics software, fax elaborate gridded works around the world, produce video and photographic composites, involve himself in any number of novel and topical issues and effortlessly attract publicity, but this is only to be a jack-of-all-trades. Katz, ten years his senior, also works on a grand scale at times, occasionally designed for the theatre, but for the most part has patiently developed a distinctive drawing and touch, that also parallels Pop Art in intriguing ways and earns hard-won respect. Both in subject matter and aesthetics, the two artists are not that far apart. 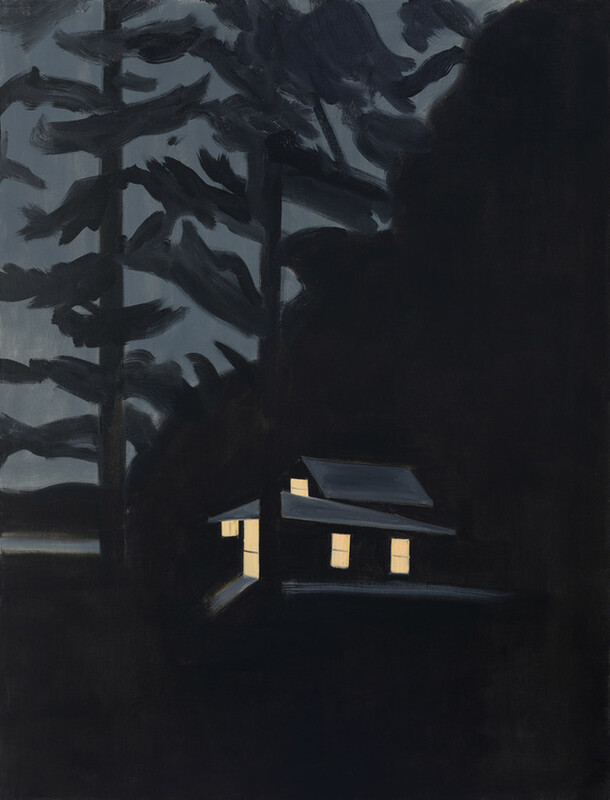 But where Katz distils landscapes to a brooding metonym and renders them with a spare, broad facture, Hockney dithers in the byways, at home now in clichés. The difference is one of character obviously, but touch is also a matter of pictorial values. Touch is knowing what is too much. 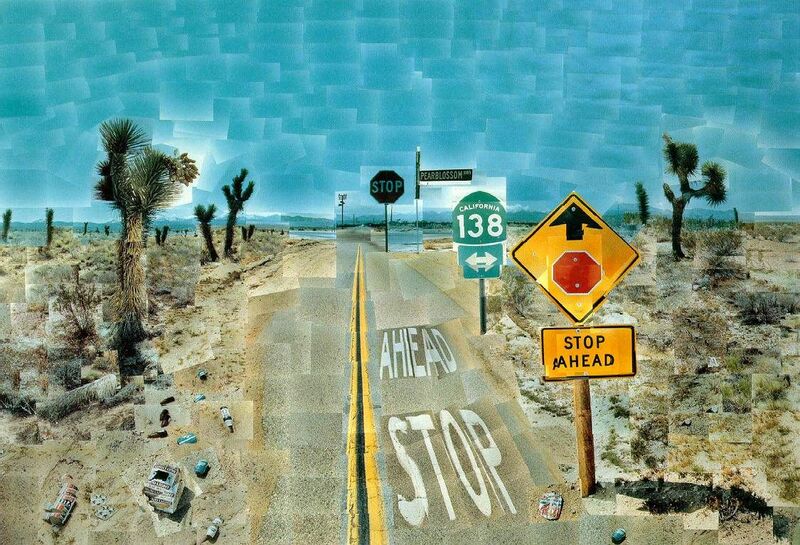 Hockney began as an artist with a compelling touch but lost it as he attempted to broaden his approach. One cannot really blame him; many artists do their best work young. Andre Derain is an example of one who achieved recognition very quickly only to be drawn slowly in more conservative directions. Like the young Hockney, he too was quite a dandy and never at loss for words. It is perhaps inevitable that one who begins so brightly must end dull, that the mischievous gadfly, wielding the most engaging of touches, should end as crashing bore. But that does not make it any easier to celebrate. See also interesting commentary by Francesco Mazzaferro on continuing controversy. For standard account of the history of optics see Wikipedia. See also detailed commentary on an artists’ forum – Wet Canvas.